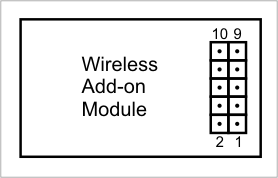 This connector is used to plug in an optional wireless add-on, such as the WA2000 Wi-Fi add-on, as well as other add-on modules that may be released by Tibbo in the future. The connector has 10 pins, as shown on the drawing below. Apart from the ground and Vcc (3.3V) lines, there are eight I/O lines that are connected directly to port 1 (GPIO lines 8-15) of the EM1206. It should be noted that GPIO lines 8-15 can be used for any desired I/O purpose, not just to control a wireless add-on board. You can use this connector for your own control purposes.